Metal spinning is a cold working process in which a flat metal disk is affixed to a lathe mandrel. The mandrel is then rotated at high speeds while shaping tools called spoons apply pressure to the disk, which gives the disk shape. 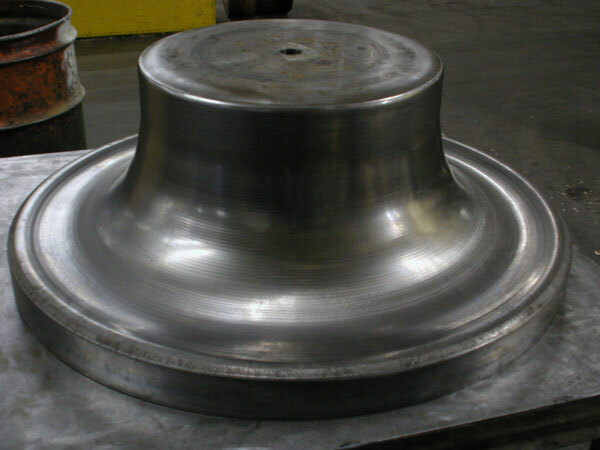 Titanium Spinning – Acme Metal Spinning Inc.
Metal spinning is a cost-effective process that creates high quality, strong, durable metal shapes that are used in automotive, architectural, manufacturing and many other applications. A metal spinning process can turn a disk into bowls, finials, door knobs, candle holders and many other kinds of shapes. Titanium is a popular construction material for a wide range of metal shapes, and metal spinning is often employed to create some of them. Titanium is characterized by its high strength-to-weight ratio, and it is for this reason a popular alternative to steel, which is heavier. Titanium can also be alloyed with other metals in order to improve the performance of the finished product. Metal spinning is commonly used to create decorative products; because of titanium’s natural luster, it is often spun into decorative products. Titanium is not the only metal that can be shaped by the metal spinning process. Aluminum, copper, stainless steel and many other metal varieties are frequently shaped by metal spinning. Titanium is used when a combination of high strength, durability and low weight are necessary. Metal spinning is a cold working process, which means that it is performed at or near room temperature. In this way, metal spinning is different from other metalworking processes, many of which are hot working. A hot metalworking process involves heating a metal near or beyond its recrystallization temperature in order to make it easier to form. This process can form metals easily and quickly, but most metals are susceptible to oxidization and other undesirable changes to their composition when subject to high temperatures. Metal spinning eliminates the possibility of undesired changes in metal composition because of its low working temperature. The result is products with excellent qualities of strength, durability and appearance. When combined with CNC spinning technology, metal spinning becomes a very effective, economical metalworking choice. Titanium Spinning Titanium spinning is a metal spinning process in which round, axially symmetric titanium shapes are created by metal spinners.